St Andrew’s Church, Brechin Open Doors Event. The Vestry decided, last year, that it would be a good idea for the Episcopal Church in Brechin to take part in the Angus Open Doors Day. This national event aims to encourage the public to access buildings of some architectural merit that are not usually open to the public and to showcase the built and cultural heritage we have locally. Open Doors Day is co-ordinated by the Scottish Civic Trust and in Angus takes place on the first weekend in September. www.doorsopendays.org.uk. The local Angus Co-ordinator kept us well- informed about health and safety, publicity and how to obtain feedback. Posters were also supplied. It was decided that, if the church were to be open and as the date was at the start of September, it would be good to have it decorated for Harvest. We were keen to encourage younger people to come and look round, so some Harvest activities were arranged that they could participate in and act as a reminder of the wealth of great food available for us in Angus. 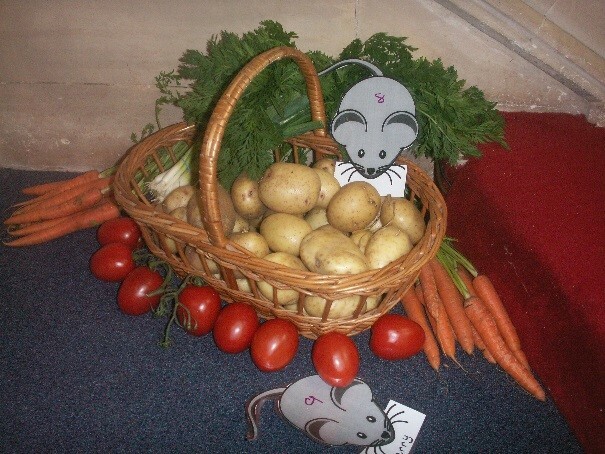 A treasure hunt centred round: finding harvest mice amongst the various foodstuffs, making a super Harvest sandwich and designing a border for a Harvest prayer. a composer from Edinburgh and former church member, played in the morning. The congregation, especially the Flower Guild, worked really hard together to decorate the church and ensure it was looking at its best for the event. Sadly, on the day, only about twenty- five visitors looked in, including a couple from Aberdeen who were visiting all the buildings open in Angus! Some stayed for quite some time and feedback was good .One elderly gentleman said he was surprised given the excellent acoustics that we had kept so many pews. ‘This would be a lovely venue for recitals!’ The children loved their activities but again, few came, despite good publicity. I do hope we can take part in this event again and maybe even put some of our beautiful vestments on display. Hopefully, those who came, will realise we are a friendly, welcoming, congregation who are fortunate to have a beautiful building in which to worship and meet together. Refreshments were provided and there were plenty of church members on hand to chat with visitors.